This event was hosted by Benjamin Franklin Ferree at his home in Pittsburgh, Pennsylvania. 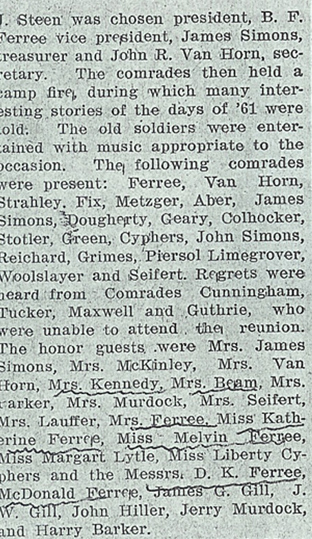 The following article appeared in the Pittsburgh Herald Vol. XVI No. 124, Saturday, September 23, 1911. 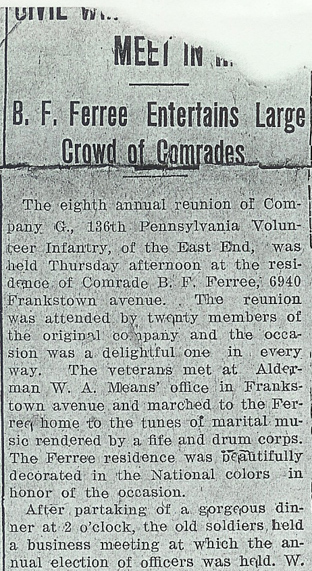 Organization: Four companies of this regiment, E, F, G, and H were recruited in Allegheny County. A and D were recruited in Tioga, B in Luzerne and Tioga, C in Dauphin, I in Crawford, Centre, and Columbia, and K in Cambria. 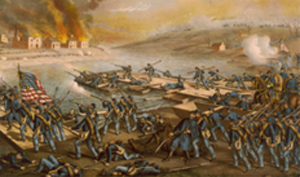 The regiment was organized at Camp Curtin in Harrisburg on August 20, 1862 and attached to the 2nd Brigade, 2nd division, 1st Army Corps, Army of the Potomac. Field officers chosen were Col. Thomas M. Bayne of Allegheny County, Lt. Col. Isaac Wright of Allegheny County, and Major Charles Ryan of Tioga County. 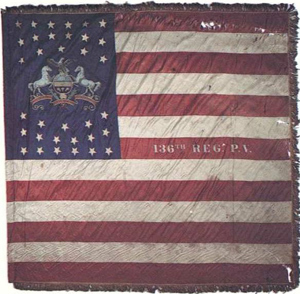 At the conclusion of their term of service, the regiment returned to Harrisburg and were mustered out on May 29, 1863. During that term of service they lost 3 officers, 23 enlisted men were killed or mortally wounded, and 30 enlisted men died from disease. Duty at Washington, D. C.
Burnside's 2nd Campaign "Mud March"
Sources: "A Compendium of the War of the Rebellion Compiled and Arranged from Official Records of the Federal &Confederate Armies" by Frederick H. Dyer; "History of the Pennsylvania Volunteers 1861-1865" by Samuel P. Bates; "Pennsylvania Civil War Flags" cpc.state.pa.us/main/cpcweb; Personal papers and documents owned by Ed Rech. Our acknowledgement and thank you to Ed Rech who provided documents and information for this article. Ed is a ninth generation Ferree descendant on the Daniel Ferree and Anna Maria Leininger line.